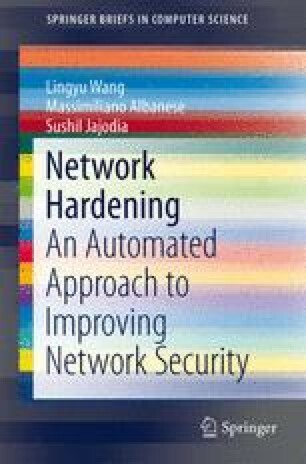 In this chapter, we provide a brief review of related work, including attack graphs and applications, existing network hardening techniques, and other relevant topics, such as alert correlation and security metrics. Network associates,cybercop scanner. Available at http://www.nss.co.uk/grouptests/va/edition2/nai_cybercop_scanner/nai_cybercop_scanner.htm. R. Deraison. Nessus scanner, 1999. Available at http://www.nessus.org. IBM. IBM tivoli risk manager. Available at http://www.ibm.com/software/tivoli/products/risk-mgr/. SRI International. Event monitoring enabling responses to anomalous live disturbances (EMERALD). Available at http://www.sdl.sri.com/projects/emerald/. System Scanner Internet Security Systems. Internet security systems, system scanner. Available at http://www.iss.net. Nmap-network mapper. Available at http://nmap.org/index.html. National vulnerability database. available at: http://www.nvd.org, May 9, 2008. P. Stephenson. Using formal methods for forensic analysis of intrusion events- - a preliminary examination. white paper. available at http://www.imfgroup.com/DocumentLibrary.html. The MITRE Corporation. Common weakness scoring system. http://cwe.mitre.org/cwss/, 2010.